From Yahoo! 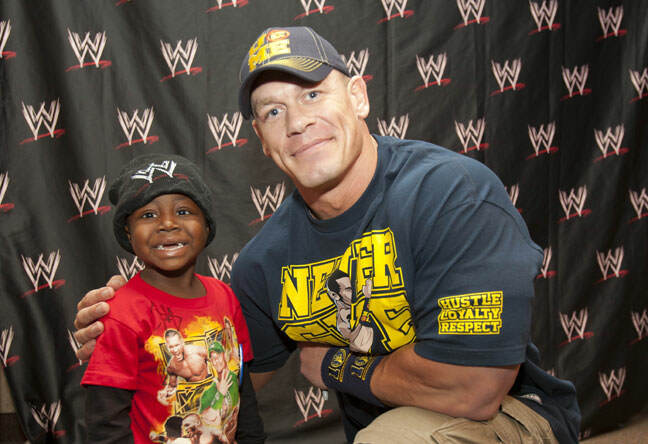 News we’ve picked up this story of pro-wrestler, John Cena (PeekYou profile here), and his commitment to providing inspiration and hope to sick kids, through his work with the Make-a-Wish Foundation. If you’re not familiar with Make-a-Wish‘s work, you can visit their website here. In brief, however, this incredible organization helps grant wishes to children with life-threatening illnesses. Often, these wishes may include meeting a celebrity or hero. Cena granted his 400th wish for the foundation when recently meeting 9 year old Mark, at the Staples Center in Los Angeles. To learn about Cena’s career with the WWE, as well as his charity work, and beyond, visit his PeekYou profile; where you’ll find videos, photos, social pages, articles, and so much more.